Activist San Diego (ASD) hosted a panel and discussion about the prison industrial complex. 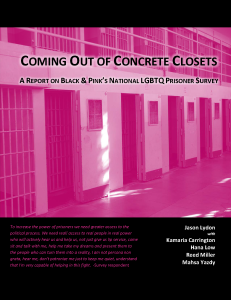 Black & Pink-San Diego discussed the disproportionate number of LGBTQ people in prison and the school to prison pipeline as well as the dangers that transgender and gender variant people face in the prison system. There was also a debate about the concept of prison abolition as well as the need to end the war on drugs. As part of Activist San Diego’s (ASD) Activist Film Series, ASD hosted a film screening of “Cruel And Unusual,” a documentary depicting the lives and struggles of transgender women in prison. Black & Pink-San Diego introduced the film and gave a short talk and introduction to the film. After the film, Black & Pink-San Diego facilitated the discussion about thoughts that people had of the film as well as to discuss the need for advocacy and to raise awareness. 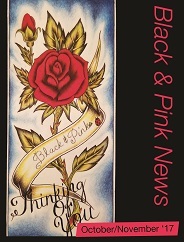 Black and Pink-San Diego is making a call to action for pen pals for 14 prisoners currently incarcerated in Richard J. Donovan Correctional Facility (RJD) also known as the “Gender Identity Dysphoria” Facility. We will host a postcard party in which members of the community will join us in making postcards to send to LGBTQIA identified prisoners in RJD Correctional Facility. There will be music, vegan potluck, and art supplies provided. Black & Pink-San Diego has officially joined forces with Californians United for a Responsible Budget (CURB) to stop the expansion of Richard J. Donovan Correctional Facility in San Diego. They will be joined by Students Against Mass Incarceration (SAMI) at UCSD, New PATH (Parents for Addiction Treatment & Healing), All of Us or None-San Diego, and United Against Police Terror- San Diego. There have been weekly meetings and collaboration among these organizations to focus on action plans and organizing. We had a great turnout for our Valentines Cardmaking Night in SF on Feb 6. We sent about 30 handmade cards to folks in nearby prisons. We are in the midst of planning our March Letterwriting Night, which will be held in the East Bay. We just had the 4th meeting of our study group, which is closed now for the next 2 sessions. It will reopen for new folks to join in June. Email flyingoverwalls@gmail.com if you’re interested. 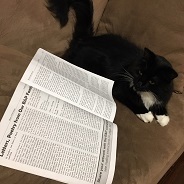 In the meantime, all our readings are listed on our website (http://flyingoverwalls.wordpress.com/study-group/) so folks can read along with us. Many of us continue to support TGIJP at their weekly volunteer nights (http://www.tgijp.org/prison-mail-evenings.html), sending resources to incarcerated queer and trans folks. Janetta Johnson just returned from representing the needs of incarcerated trans folks at the WPATH conference in Bangkok. Oh, and we had a lively conversation over email with a person working with a local Hillel chapter about our chapter’s stance as explicitly anti-Zionist and about our views on the relationship between incarceration and occupation. We’re thinking of ways to integrate this more visibly into our website and the work we do. Black & Pink folks are discussing starting a chapter in New Orleans! We intend to have a conversation with interested community members and leaders of organizations we aim to be in solidarity with on Monday, March 17th, 7:00pm at Fair Grinds. Please contact reed@blackandpink.org for more info! We have Supported and worked on an Anti-Shackling Bill with a statewide coalition to prevent the shackling of pregnant prisoners in Massachusetts. Thanks to the work of this coalition, the Governor ordered an immediate end to shackling! We are still working on getting the legislation passed, and know that our work must continue beyond the passage of legislation, but we have made a lot of progress and want to celebrate that with you all. We met Laverne Cox at a talk that she gave at harvard university! Jason and Justice chatted with her about Black and Pink and the importance of supporting LGBTQ folks who are incarcerated. We kicked off the National Know-Your-Rights Network in Boston! This is a national network being coordinated by our friends BreakOUT and Streetwise and Safe. We are meeting with Boston area organizers who work on the criminalization of LGBQ/T youth, particularly youth of color, to determine how we can compile resources and build a local contribution to the nationwide movement against the criminalization of LGBQ/T youth. We joined Community Justice Network for Youth. Since our last update, we have had 2 amazing Penpal Support sessions at the People’s Law Office. This has been a great time for free-world pen pals to meet up, go over pen pal basics, and troubleshoot with each other about the issues coming up in our letter writing. Our second meet up also featured two incredible prisoner advocates who shared their knowledge on advocacy and being a pen pal. Our weekly mail processing meetings are still going strong with several regular volunteers reading and responding to incoming mail and matching up new pen pals. As part of our political education efforts, we gave a presentation and letter writing workshop to a criminology class at Loyola university, launched our newest study group on Food Systems and the PIC, and we had a great turnout for our screening of Herman’s House!